Newly manufactured Wolf Military Classic; this ammo is manufactured in one of Wolf's legendary production facilities in Russia. Wolf ammunition is as rugged as the country it comes from. If you're looking for a great value in a steel-cased 380 Auto (ACP) round, you've found it with Wolf Military Classic. This ammunition is a great value for a great performing round. These steel cases feature a polymer coating to insure smooth feeding and extraction and are easy on your wallet. You're sure to love every minute you're at the range with this ammunition. 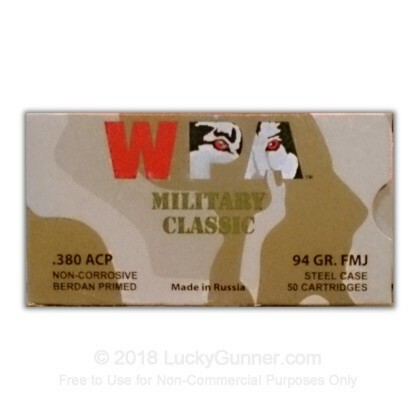 Pick up a couple 50 rounds boxes before your next range day! Several of the reviews pointed out failure to fire experiences, pointing out that primer and gun were a factor. l shot mine thru a Sig .380 and a Makarov .380. Sig had 2 out of 25 failure to fire. The Makarov fired the lot. Of course the Makarov can also be used as a hammer or club. I wouldn't use them as a duty ammo but for what I bought it for it works okay. Rounds were accurate and recoil was consistent. However out of 18 rounds I had 7 FTE. Surprisingly clean though. I would only use these rounds for the range, I wouldn't load my sig with these for EDC. They work great for the range or for just breaking in a new gun. I used a Sig p238. You get what you pay for.. usually. I have fired 25 rounds so far and had 2 misfires. The primer was struck, but failed to fire. I fed them back thru and they fired the 2nd time around. Now i bought this ammo for practice only and the real world drill of a clearing a misfire [twice] was was good from a practical standpoint. I will not buy this brand again. There were at least 3 rounds in every box I shot that did not fire! The primers were struck perfectly but no fire! I would not recommend this ammo! I also had feed problems (Glock 42). All other ammo I've used worked fine! It is also very dirty! I had to spend 20 minutes just on the barrel of my new Glock 42 to get it clean. The only positive is the price but spend the 2-3 dollars more a box and get a decent ammo for the range! Feeds & fires without problem in my Bersa thunder. Cheap for practice, not reliable. Used in my Bersa .380 and Walther ppk. Very flashy discharge and basically worked like any other. However miss fired rate of 1 in 30. Never would I carry this type of ammo because it's not reliable at all. Only had two issues with loading and ejecting the cases. I'll find another type of ammo even for just practice. Not a good experience with this ammo and my S and W Bodyguard 380 . Price was attractive but this ammo simply would not feed correctly. Also experienced several failed primer strikes. Abandoned trying to shoot this after only 15 rounds and a whole lot of problems. Continued shooting my Blazer Brass and American Eagle with zero problems.. so all the problems were due to this brand of ammo.